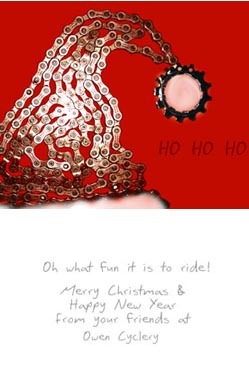 Skeese Greets, Greeting Cards for the Athletically Minded, is currently offering a "free custom verse" promotion of its cycling themed holiday card collection. From now until October 19th, IBDs and sporting goods manufacturers can get free customized inside verse with a bulk purchase of 100 cards or more. The current holiday collection includes unique and colorful designs created out of used bicycle chain that forms the shapes of snowflakes, Santa's Hat, holly, a snowman, a poinsettia, a Christmas Tree and an angel. Most of the designs offer pre-printed verse. For example, the Snowman design reads, "Wishing you holiday cheer and great rides throughout the year." "Sending customized Christmas cards to our customers really makes an impact," says Jack Murray, owner of Jack and Adams Bicycles. "Shoppers come back from the holidays thanking us for the cool card they received in the mail." The 5.5 x 4.25 inch cards are printed on glossy card stock and come with a matching gray envelope. The "free custom verse" offer lasts until October 19th; afterwards custom verse can be added for an additional charge.